If you’re like me, you can get a little enthralled by everything you do on your computer. It can be hard for me to take my eyes off the monitor at times. The longer you look, however, the more tired your eyes can get. Especially if you find yourself straining your eyes to read small text. For those of you who spend a lot of time on the computer, there are ways you can improve your Windows 7 interface. 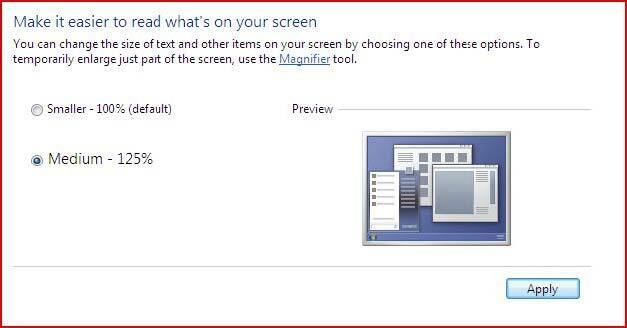 Here are some steps you can take to make the text on your PC monitor easier to see. The first step you can take to make the screen easier to read is increasing the size of your text. Larger words will of course make your screen easier to read. To increase text size perform the following actions. Right-click on your desktop, and select Screen resolution. Towards the bottom of the window, select Make text and other items larger or smaller. Medium – 125%. Makes text 125 percent larger than normal size. Once you have chosen your desired size, click Apply. You will then see the changes after you restart your PC. ClearType is a feature of Windows that allows you to make your screen text nearly as clear and easy-to-read as the text in a book. This feature is usually turned on by default, but here are the steps you can take to ensure that you are using ClearType for maximum ease of reading. Click the Start button, then select Control Panel. In the search box, type cleartype, then select Adjust ClearType text. First, make sure Turn on ClearType is checked, then select Next. Proceed to follow the steps on each page, then click Finish to save your settings. Though these tips are likely to make it any even more difficult to pull yourself away from your computer from time to time, it will definitely help make your screen easier to read and your Windows experience that much more enjoyable. Now you don’t have to strain your eyes. If you don’t have Windows 7, these features are also available in previous versions of Windows including Windows XP and Windows Vista. The steps to access and apply these features may vary slightly. If you have other tips to help PC users make their screens easier to see, please feel free to share in the comments below.